Georgia couple John and Fin Kernohan found a way to blend their two passions: tiny home living and teaching fire safety. Now, they're hitting the road with the first tiny house inspired by firefighters! Use the mouse to guide your way through space and click on the circles to reveal additional details and information. The enterprising pair are no strangers to the tiny lifestyle. For the past five years, they have lived in a 304-square-foot, off-the-grid tiny home they built by hand and nicknamed the “Beloved Cabin.” They’ve also led the charge in promoting the tiny house movement, hosting the largest annual tiny house festival in country for the last two years through their organization, United Tiny House Association. This year, the event was held in Augusta, New Jersey, where TODAY Home got an close-up look of their latest endeavor: Tiny Firehouse Station No. 9, the first ever tiny tribute firehouse. John Kernohan had been fascinated by firefighters and first responders since he was a boy, so the idea to build a tribute firehouse fulfilled a life-long dream. “I still get excited when I see fire trucks,” Kernohan told TODAY Home. The couple wasted no time making their dream a reality, building the 148-square-foot home by hand with a team of builders from Free Range Tiny Homes in just five weeks. They worked with the chief at the Putnam Country Fire Department in Georgia to design a home focused on teaching fire safety (the structure is not a working station). 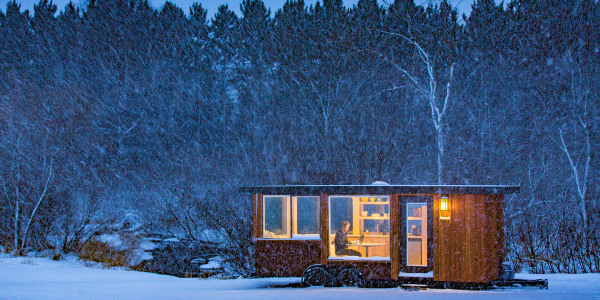 “A lot of tiny homes have just one entrance point, other than the windows,” Kernohan said. Based on the advice of the fire chief, they installed three different exit points on the house — French doors on one end of the home, a gate connected to the bathroom on the other and a set of small French doors that opens from the bedroom loft to a balcony with an escape ladder to the ground. “In the event there’s an emergency, there are great opportunities to exit and great opportunities for some hero in red to get in,” Kernohan said. Not to mention, the house has a restored brass fire pole used to slide down from the loft to the first floor. “It’s also a quick way to get the bathroom at night!” his wife said with a laugh. The couple keeps a fire extinguisher in an established location and a working smoke and carbon monoxide detector near the kitchen — items every house should have no matter the size, though it's especially vital in a tiny home. “It’s really important because a tiny house sits behind a vehicle and there’s the chance of carbon monoxide gas coming in,” Kernohan said. Completed in April, they decided to take it on the road, stopping at fire departments around the country to fundraise and educate the public. As the first tiny firehouse of its kind, the Kernohans designed it with the option to run off the grid using a solar array coupled with 12-volt Trojan batteries, the same type used in fire trucks. Antique items like vintage fire helmets, old hoses and fire extinguishers were donated by various fire stations to add to the decor. In fact, they stripped down an old fire truck at a scrap yard, using its pieces to furnish the home. They repurposed the pressure gauge panel and some of the truck siding on the home's exterior and installed a light bar, horn and PA system from the truck. No dinner bell needed here! Fin Kernohan added personal touches from her native Thailand with colorful accent pillows, baskets and an inviting couch in the lounge area. The compact kitchen has a sink with a pedal fixtures, a two-burner stove top and a retro-style mini fridge. The loft is surrounded by windows and skylights — perfect for stargazing — and the back wall has French doors that open to a small balcony. To keep with the theme, they even restored an old fire hydrant just outside the bathroom area that serves multiple functions: It’s an outdoor water source, a weight balance and a tow hitch! Now that’s a tiny house with a life-saving purpose!